The Terminology Module provides an overview and guide to the FHIR resources, operations, coded data types and externally-defined standard and FHIR-defined terminologies that are used for representing and communicating coded, structured data in the FHIR core specification and profiles. 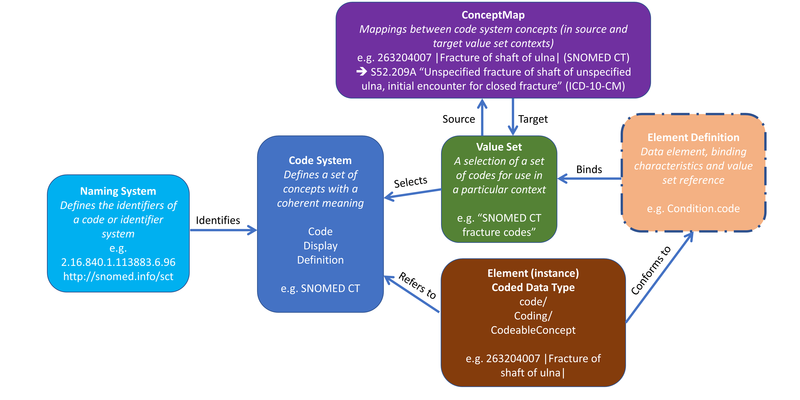 Collectively, these capabilities are used to provide the terminology service functionality required for supporting the use of coded data in FHIR resources throughout the specification as described in the other modules. For security considerations for terminology services, see the Terminology Service page Security section. For more general considerations, see the Security and Privacy module. The following terminology resources have been tested and are being used in production tooling and now are normative or are expected soon to progress to normative. Other terminology resources are still in earlier stages of development. We intend to continue to develop and test these resources and advance them through the Maturity Levels at Connectathons and elsewhere.